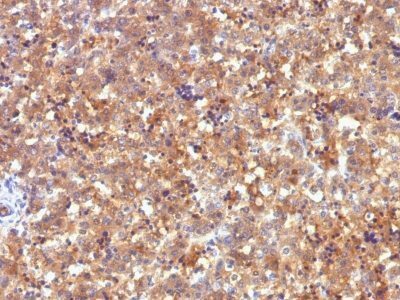 This antibody recognizes an oncofetal glycoprotein with a single chain of 70 kDa, which is identified as alpha fetoprotein (AFP) (ISOBM TD-2 workshop). This antibody recognizes an oncofetal glycoprotein with a single chain of 70 kDa, which is identified as alpha fetoprotein (AFP) (ISOBM TD-2 workshop). This MAb is highly specific to AFP and shows no cross-reaction with other oncofetal antigens or serum albumin. AFP is normally synthesized in the liver, intestinal tract, and yolk sac of the fetus. Antibody to AFP has been shown to be useful in detecting hepatocellular carcinomas (HCC) and germ cell neoplasms, especially yolk sac tumors. Catalog number key for antibody number 0523, Anti-AFP (C2) The prefix indicates conjugation, followed by the antibody number and size suffix.